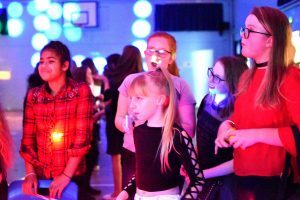 On Thursday the 8th February, the PFTA held a Valentine’s Disco. 105 students and 22 members of staff danced the evening away with the help of William Mengual in Year 8 who kindly offered to DJ the event. Everyone had lots of fun and we managed to raise £171.94 in total profit! A great big thank you to MissWarr who bravely offered to man the refreshments with the help of Sixth Formers who used the experience as part of their A-level work. Congratulations to Amy Rout in Year 8 who won the ‘How many sweets in the jar’ competition! We are still looking for more parent volunteers for the PFTA, so if you would like to be more involved, then please contact Mrs Kemp at the school.